If you didn’t get that tablet you wanted for Valentine’s Day, the Microsoft Store is giving you a chance to treat yourself to one for less. For a limited time, the retailer has dropped the price of its Microsoft Surface Pro 4 128GB Intel Core m3 4GB RAM model to $799 from $899. That’s a savings of $100. You also can save $100 on other versions of the product, which vary in price depending on storage capacity and processor. 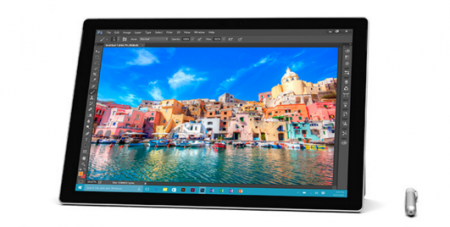 The Surface Pro 4 features a 12.3-inch PixelSense touch-screen display, Windows 10 Pro and a Surface Pen. This offer is valid through 11:59 p.m. PST Saturday (Feb. 27), while supplies last. There is a limit of three per customer. See the retailer’s website for full details. Still deciding whether you should splurge on the Surface Pro 4? Check out our comparison of the Microsoft Surface Pro 4 and the iPad Pro. Find this deal at the Microsoft Store.